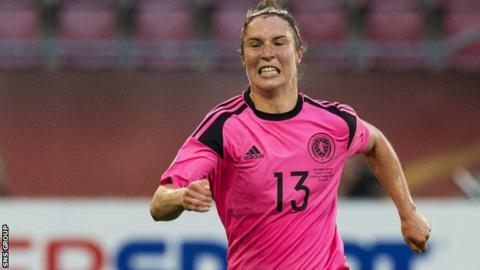 Scotland came from behind to win their Women's World Cup qualifying opener against Belarus in Minsk. Jane Ross levelled from close range soon after Anastasia Kharlanova's 25th-minute goal for the hosts. The persistence of Manchester City striker Ross then led to a second-half own goal from Anna Kozyupa. Scotland should have scored more goals, but still ensured Shelley Kerr's first competitive game as head coach ended with a victory. Kerr made three changes to the side that had started in the 3-0 friendly win over Hungary last month. Kirsty Smith and Jen Beattie came in for Chloe Arthur and Joelle Murray in the back four, while Christie Murray was preferred to Lana Clelland in attack. Both sides had decent chances to score in an attacking opening 10 minutes. Caroline Weir was brought down unceremoniously outside the box by Kozyupa. The Liverpool midfielder took the free-kick herself, forcing Natalia Voskobovich to make a good save. Then Ross ran in behind the home defence but took a heavy touch just before she was going to shoot. Goalkeeper Lee Alexander, making only her second appearance, then had to react sharply to deny Kharlanova at the other end. The opportunities dried up before Belarus scored with only their second attempt midway through the half. Anastasia Shuppo crossed from the right and Kharlanova's lob from six yards looped over Alexander. Scotland needed a quick response and they got it. Ross shot from outside the box, forcing Voskobovich to tip the ball over for a corner. Weir's delivery was bundled home by Ross. The visitors started the second half on the front foot but could not capitalise because of poor finishing. The best chance came six minutes after the restart. Lisa Evans got behind the home defence on the right, with Ross and Claire Emslie also clear inside her. The low cross was landed at the feet of the latter but she failed to find the target. Scotland finally took the lead after 62 minutes thanks to the skill and tenacity of Ross. She cleverly dummied the ball on the halfway line and, though blatantly held back by Elvira Urazeva, ran into the Belarus box. Her low cross was turned into the net by Kozyupa and that proved enough for the three points. Scotland next face Albania at home on Tuesday. Scotland head coach Shelley Kerr: "It was the same as last year, when we beat Belarus 1-0 in the Euro 2107 qualifier here - but we created more chances this time. "I would think it was easily double figures - and we knew if we switched off at any point they could score against us. "Our attacking play was much better in the second half. "We've still got work to do, but when you play a World Cup qualifier away from home what you want is to come away with three points."